Stockbridge Series: Is middle school worth the trouble? Stockbridge's middle school has begun to implement programs to improve student behavior and build technical skills. Educators at Stockbridge middle school need to balance student's emotions and set learning expectations. Students at Stockbridge middle school-where they are working hard to improve test scores. A teacher at Stockbridge middle school. Class sizes are bigger there than in any other district building. When Gabe Schray was in middle school in Stockbridge, he admits he was kind of a mess. He got bullied, in part because he was a new kid. He moved to Stockbridge to live with his dad after he had to leave his grandparents house. “Yep, my grandfather he died in front of me, so, you know, " said Schray. Schray started to get it together after his freshman year of high school. He says joining the football team saved him. He's a senior now, and he is well-liked, funny, confident and going to a good college next year. New research suggests Schray was lucky, because by tenth grade if kids don’t believe they can achieve after high school it’s likely they won’t. That’s even more true for low-income kids, and almost half the kids in Stockbridge are low-income. Many kids start to set their expectations low or downgrade their dreams in middle school, and it sticks. They pick up on and care about others expectations for them. In Stockbridge the middle school doesn't seem to be held up as a point of pride in the community like the other schools. Middle school principal Brad Edwards describes it this way, “Kind of like the middle child if you will. Just kind of gets left out." Edwards has been in the principal job since the start of the year. Before that he was a teacher at the middle school for a little over a decade. He has big plans, but as it stands the middle school is a sore spot in the district’s aim for high performing schools. Middle school reading scores on standardized tests were up this year after a lot of effort. However, when compared to the district's other schools, scores are still lower across the board at the middle school. Edwards says his staff is just as dedicated and talented as in the rest of the district. But they have a tough job. The class sizes are bigger at the middle school, the district is strapped for cash, and so far the middle school hasn’t carved out a program or educational approach that can attract outside grants and that people rally behind. And then there’s managing the students, who need a lot of attention. He goes on to say people shouldn’t write middle schooler’s off or ignore them, even if they’re demanding. And it’s not that the middle schoolers in Stockbridge are being ignored, it’s more like the district isn’t sure what they want from them and how much they should expect. There’s even indecision about the middle school’s building. It’s the oldest in the district, built in the 1920’s and showing its age. The school board and the administration need to decide if they want to ask the cash strapped town to approve a property tax hike for a renovation or if they’re going to figure out another plan. 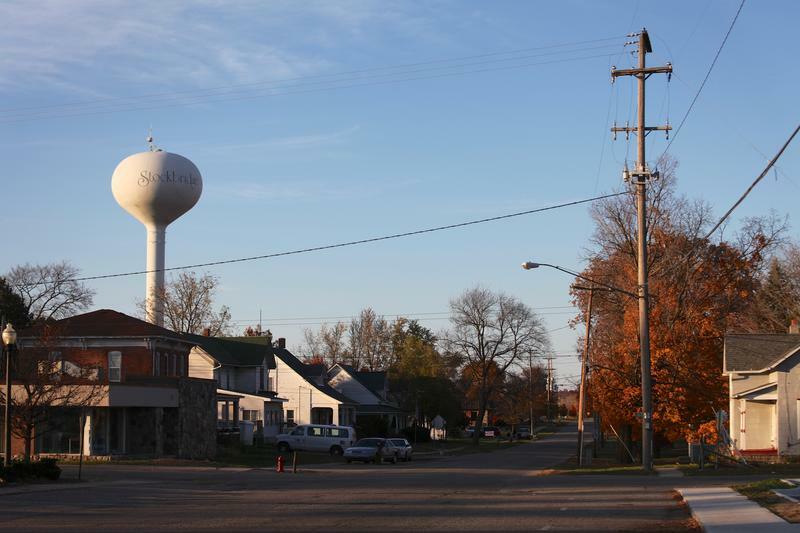 The town hasn't turned down in a millage hike in almost 20 years, but school officials seem nervous about this one. Principal Brad Edwards thinks as a district they need to refocus on middle school. He thinks the push for college readiness is going to require schools to get started building kids skills even before high school. Says Edwards, “If you want to see success rates of kids going to college and to be ready for the technical skills, whether they’re going to college or going into a trade or something, I think it really starts 7th or 8th grade,"
The student in this piece, Gabe Schray, is one of the Youth Journalists participating in our Stockbridge coverage. With humor and candor he takes us with him to see how football helped him gain confidence. Do high expectations for "at risk kids" make a difference? Robin Lowe Fletcher grew up in Stockbridge and she now owns one of the beauty salons in town. Fletcher and her husband have one son in high school and one in kindergarten. Before kindergarten they were really worried about their youngest, Brenden. The school was supposed to be good, it’s been recognized by the state as a "reward school" and has a solid reputation. But they thought people there might not help their son succeed, or that they might find ways to keep him out of their school. I’m the “new kid”, for the first time in my life. I moved two and a half hours away from my hometown Armada. I was starting school soon; afraid I wasn’t going to fit in. I had my sister, a year younger than me, was by my side but, that didn’t stop my nerves from jumping all over the place. We took a tour of Stockbridge High School a week before school started. The outside light dimmed the halls as we walked around with our mom and the school principal dodging chairs, desks and cleaning equipment.